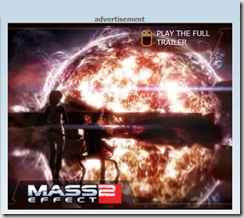 There’s an ad over on MSN UK for the new “Mass Effect 2” game and it’s very distinctive as it’s done in Silverlight and has some really cool aspects to it such as making use of Smooth Streaming and DeepZoom. It’s not often ( well, ever ) that I’ve linked to an ad before or suggested that someone watch one but I think this is really worth a look at to see the sort of quality that you can get from Silverlight in an ad like this. It’s also worth going full screen with it and experimenting with the navigation system. Click the image below to jump to the page ( although, of course, ads run for a duration and so I guess it may not still be there if you get to this post in a few days/weeks time ). You can find more detail on the ad from the guys at Metia ( ooh – nice Silverlight home page too 🙂 ) who put it together. Steve Ellis has a post over here about it and Dean Gifford has one here which spells out a little more detail about what you’re looking at. Silverlight 4 – Writing a Windows-Only Application via COM Interop?